China Makes Everything. Why Can't It Create Anything? 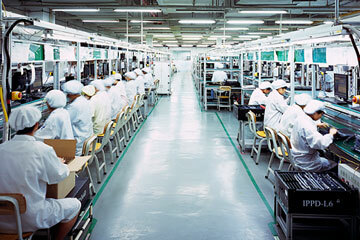 A Foxconn plant in Shenzhen, which puts together, among other products, the iPhone. China's workers may not like it, but what they faced at Starnes' factory will become more common. China launched its economic ascent by tossing its giant, impoverished workforce into the global supply chain. Labor was so cheap and plentiful that few other countries could match it. But with the population aging rapidly, thanks to the government's one-child policy, the workforce is shrinking, while the abundance of opportunities in the fast-growing economy has made monotonous assembly-line work less appealing. As a result, wages are skyrocketing. Starnes says that over the past 10 years, the cost of a worker in his factory quintupled to $500 a month, and even with that increase, he couldn't find enough staff to fill his needs. By contrast, in Mumbai, where his new facility is based, workers are 75% cheaper and far more plentiful. The competition for talent in China is so fierce that all sorts of employees earn well above what their counterparts receive in other emerging economies. According to data on median salaries collected by consulting firm Mercer, a machine operator earns $6,405 and a skilled secretary $11,213 in Beijing, significantly more than the $4,817 and $7,809, respectively, in India. "Companies have gone to China to find cheap labor, but it isn't there anymore," Starnes says. "Now you are forced to look elsewhere." Rising costs are even making China less competitive compared with the U.S. The decision to offshore production to China was once almost automatic for American executives  high costs in the U.S. made staying almost impossible. But that is no longer true. Boston Consulting Group (BCG) figures that, taking into account rising wages, labor productivity and other factors, the cost of manufacturing in China will be roughly equal that in the U.S. by 2015. No wonder a BCG survey of large U.S. manufacturers, released in September, showed that 21% of the respondents were either actively bringing production back to America from China  a process known as reshoring  or planning to do so over the next two years. Michael Araten, president of toymaker K'NEX, began reshoring in 2009 to preserve jobs at his Hatfield, Pa., factory during the Great Recession. Examining the operations, Araten came to realize that manufacturing in China was not as efficient as the firm had believed. There was what he calls the "China handicap"  the added burden of large inventories, inflexible supply chains and missed market opportunities caused by long-distance production. By investing in automation, K'NEX has been able to return almost all of its parts production and most of its finished product assembly back to Hatfield while maintaining profitability. "China is at an inflection point," says Araten. "The world inverted over the past 30 years and China benefited; now it is inverting again and America is the beneficiary." Not just foreign companies are looking to ship out. Last year, footwear maker Huajian, based in the southern industrial town of Dongguan, invested $15 million in Ethiopia for a factory, attracted by wages one-eighth of those in its Chinese plants. Over the next five years, Huajian plans to expand its workforce in the African nation from 2,800 employees today to 30,000. Huajian chairman Zhang Huarong believes Chinese shoemakers need to do more than compete on cost to ensure China's future in the industry  they must focus on R&D and improving productivity. "Before, the model was to follow the cheap labor, but now Chinese companies should change their attitude," he says. COMPANIES LAG BEHIND IN TECHNOLOGY. Some Chinese companies, most notably telecom-equipment maker Huawei, are globally competitive. But they are rare. Most lag behind in critical technology. Ask Li Shufu, founder of Hangzhou-based Geely. In 2006, Geely made history by becoming the first Chinese automaker to display a model at the North American International Auto Show in Detroit. Back then, the hard-charging Li had a grand plan to export his small sedans to U.S. consumers. That never happened. Li wisely decided his cars simply weren't ready to compete in the tough American market. "Geely needs to improve in many aspects: skills, quality, maintenance, management," he admits. Li could be speaking for his entire industry. China has dreams of becoming a rival to the U.S. and Japan in car manufacturing, but despite bottomless investment and state protection, the country's carmakers have not been able to compete head-to-head with foreign players. At home, international brands like Chevy, Volkswagen and Hyundai dominate 70% of the passenger-car market, according to research firm LMC Automotive. Overseas, Chinese exports are often driven by price-conscious consumers in poor nations. Geely and other Chinese carmakers have desperately been trying to improve by investing heavily in R&D and automation, and they are making progress. But a 2012 quality survey from the market-research firm J.D. Power shows Chinese-branded cars still suffer 80% more initial defects and other problems than international ones in China. "Putting together long-lasting, world-tested products  it takes years," says Kevin Wale, former president of GM in China. Chinese carmakers "are still going through a learning phase."